Read our helpful guide to second hand Peugeot Bipper. AA Cars works closely with thousands of UK used van dealers to bring you one of the largest selections of Peugeot Bipper vans on the market. You can also browse Peugeot dealers to find a second hand van close to you today. All used Peugeot Bipper on the AA Cars website come with free 12 months breakdown cover. The Peugeot Bipper is the smallest panel van on offer in the French manufacturer's range, and while its size certainly favours the constrained streets of the city, it has plenty of load space to equip it for lugging goods. The Tepee model is the most passenger friendly, which is remodelled into a van-MPV, and fits in plenty of space for four passengers and luggage, while the standard van model offers up to 2.8m3 of load space. 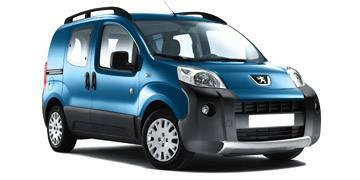 The sister car to the Citroen Nemo and Fiat Fiorino, the Peugeot Bipper is an attractive and capable panel van which is perfect for the city.